In The Zamir Group, Fair Lawn is our main home base. We also have offices in Tenafly servicing the Northern Valley Area, and Hoboken to service our Hudson County Clients, but most days you will find Zohar and the bulk of the team at our Zamir Group Office right at 20-00 Fair Lawn Ave in the heart of Radburn. 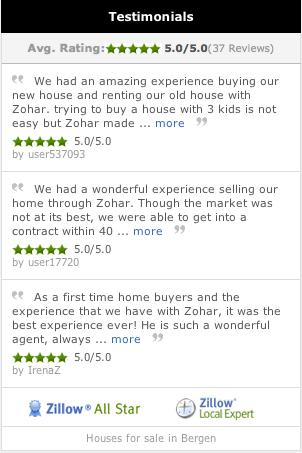 Zohar, his family and about half of our team also reside in town, and send their children to Fair Lawn schools. As we live, work, play and sell here in town, we try to keep a close eye on local news and are always ready to advise our clients of the latest developments. We were there to tell you when Fair Lawn Got All Day Kindergarten and we were at the town hall meetings and updating our clients as the town rolled out its soft border policy. Now we feel that others who are considering buying or selling their homes, or otherwise care about Fair Lawn the way we do, should know about the town’s upcoming $25 million dollar referendum to expand Fair Lawn schools, coming up this Spring. A big part of why we choose to live and work in Fair Lawn, why we raise our own kids here, and why we help so many come into this town is the amazing Fair Lawn school district. Consistently ranked among the best in the area, all of Fair Lawn’s six elementary, 2 middle and high school are among the best in their class. As more and more people come to know this, and more and more families come to town, we have seen our student population explode. Fair Lawn student enrollment was 4,653 just 5 years ago, while today it stands at approximately 5,025. The town has hired multiple outside research firms to study the trend, and both independently predict that student enrollment will only continue to grow, by approximately 100 students a year over the next five years. As we heard during the arguments for soft borders, class sizes are exploding. The district reports at least 15 elementary school classrooms with over 25 children, a number that is reportedly growing and will inevitably trickle up into the middle schools and beyond. On March 13, 2018 Fair Lawn is set to vote on a referendum that, if passed, would approve a $25 million dollar construction project to expand Fair Lawn Schools. If passed construction would begin within months. We will continue to watch this story develop and inform our clients and our community about all the important happenings in town. Want to know more? Interested in what this means for your home’s value, your taxes, your buying power and your school district? Call 201-398-9898 or stop by our office at 20-00 Fair Lawn Avenue to sit with a member of our knowledgeable team and discuss. We are always here for our clients and our community, and always welcome newcomers to both groups! The statistics and information shared here were reported by NorthJersey Media Group, publishers of the Bergen Record and the Community News of Fair Lawn, among others. PLEASE NOTE: This information is intended to provide informational background about events in the community for your awareness. We cannot verify the veracity of every statement reported by others and offer no personal opinions on these matters. This is not a political statement, but a professional service.